OKI Data Americas, which markets its products under the OKI® Printing Solutions brand, today announced that the C5550n MFP won the highly-regarded Government Computer News (GCN) “Reviewers Choice” designation in the magazine’s January 7 color MFP roundup. Receiving an overall “A-“, GCN editors praised the color MFP for its ”no notable flaws and superior performance” that took the competition by surprise. The review noted that “in terms of color quality, the OKI C5550n MFP was the best of the printers that use standard toner” and also touted the device’s ease-of-use with one-touch features – all ideal for government agencies. 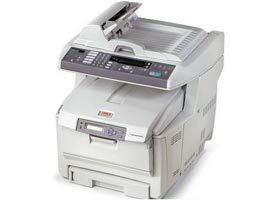 The C5550n MFP is designed as a solution to meet the needs of most small-to-medium sized workgroups. The MFP provides all-in-one functionality with convenient print, copy, scan and analog fax features that enhance workflow performance and its media flexibility enables users to print high-quality materials in-house. Users will also have the ability to further reduce costs by combining separate office equipment into one space-saving device. The C5550n MFP offers the fastest monochrome print and copy speeds in its class,1 up to 32 pages-per-minute (ppm); and competitive color speeds of up to 20 ppm2. At an estimated street price of $1,499, the C5550n MFP delivers brilliant 1200 x 600 dpi print quality and maximum media flexibility, including 8.5 x 47.24-inch banner capability in a versatile, compact device. It is available in North and South America exclusively through OKI Printing Solutions authorized solution providers. The product builds on parent company OKI Data Corporation’s history of leadership and innovation in color printing. It is based on the 7th generation of printing technologies advanced by OKI Data Corporation, such as digital LED technology and Single Pass Color. This technology allows OKI Data to manufacture products that require fewer moving parts. Every product comes with a one-year Overnight Exchange warranty and an industry-leading five-year warranty on the digital LED print heads. Like all OKI Printing Solutions products, the C5550n MFP is backed by comprehensive support from authorized OKI Printing Solutions solution providers. In addition, the company provides live, toll-free technical support 24 hours a day, 7 days a week, 365 days a year, with agents based in North America. This entry was posted on Monday, January 28th, 2008 at 9:25 am	and is filed under LED, multifunction, OKI. "Canon Pixma iP2600 Inkjet Photo Printer"